We will be having TWO one day events for $59. Each day will be a different event. 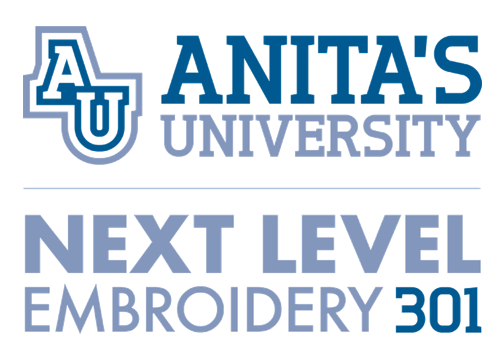 We are excited to be hosting the newest class offering to hit the Anita’s University campus, Next Level Embroidery 301! Whether you have attended our prior 101 or 201 classes from Anita’s University, or if this is your first time joining us, you’ll be amazed at the new things that you will learn! During the 301 class we are going to explore many different embroidery techniques — such as heirloom stitching, free standing lace, and coloring your embroidery project. We’ll take a closer look at unique appliqué methods such as watercolor appliqué, reverse appliqué, ghost stitch appliqué and so many more. Thinking outside the hoop, we’ll visit dimensional designs through button-up embroidery and our reverse trapunto method. This is only the beginning of the education you’ll receive, and we can’t even describe how much fun you’ll have! Friday's event will be the Next Level Embroidery 301. Early bird discount! $49 if you register during January, February or March.